In 2005, the National Institutes of Health (NIH) announced the Clinical and Translational Science Award (CTSA) program – an institution-based grant intended to re-engineer the clinical research enterprise, speeding the time from pre-clinical discovery to the development of therapies to improve human health. As universities competed for CTSA funding and often struggled to develop or recalibrate institutional infrastructures and research support services, the face of pre-clinical and clinical research changed dramatically. These changes (and their intended and unintended consequences) introduced the possibility of new roles for health sciences librarians, creating novel opportunities to engage with researchers, research administrators and community members as active partners in the research enterprise. This book demystifies translational research by providing a comprehensive historical background and context on the CTSA program, including the impact of funding reductions and administrative changes. The highlight of the book are case studies by librarians from CTSA Consortium institutions. 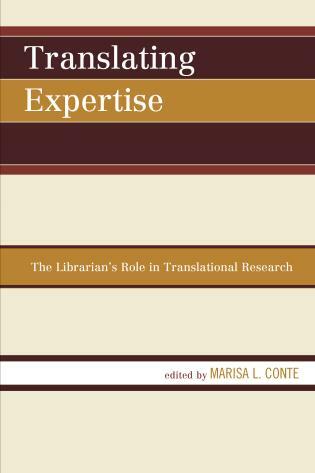 These case studies, including successes, challenges, and lessons learned, will detail specific routes to librarian involvement in translational research, including collection development, creating and maintaining relationships with researchers and administrators, instruction and training, data management, team science and more. The variety of case studies, including challenges and lessons learned, will help libraries that are looking for ways to engage the translational research audiences at their institutions, or those who currently work with CTS but face new challenges due to declining federal research funds, shifting institutional priorities, or other factors. Marisa Conte is the Research and Data Informationist at the University of Michigan’s Taubman Health Sciences Library. In this role she partners with researchers and administration to integrate library resources, services and expertise into the research enterprise. She’s worked with UM’s clinical and translational research community since 2007. Marisa is a graduate of Wayne State University and a proud alumna of the National Library of Medicine’s Associate Fellowship Program. Her research interests include biomedical informatics, data management, team science, research ethics and research policy. The book will not be a comprehensive accounting of librarian engagement at each institutions but rather a sample of “best practices” to help librarians develop programs and relationships relevant to translational research, and a look at newly emerging opportunities to leverage skills in information organization and dissemination.